Accreditation – AVALON POLICE DEPARTMENT N.J. The Avalon Police Department has the prestigious honor of having been accredited by the Commission on Accreditation for Law Enforcement Agencies (CALEA) in 2013 and re-accredited by the New Jersey State Chiefs of Police (NJSCOP) in 2016. The Avalon Police Accreditation is led by Administrative Sergeant John Roscoe. The Accreditation standards in law enforcement assure the citizens that the police department meets specific criteria of public safety services which have been set forth by national and state commissions. 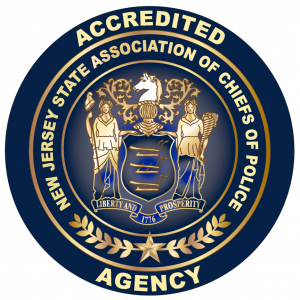 The Avalon Police Department is a professional organization and has engaged in the task of Accreditation through the New Jersey State Association of Chiefs of Police (NJSACOP) to ensure our community that this agency is held to the highest standards. Accreditation is a progressive way of assisting law enforcement agencies to improve their overall performance. Accreditation is formulated through standards, which contain clear statements of professional law enforcement objectives. Agencies who participate in the Accreditation process execute a self-assessment to determine how policies and procedures can be improved to meet these objectives. Once these policies and procedures are employed, a team of assessors validates the standards are being followed by the agency. Assessors will review written materials, interview agency members, and visit offices and other places where compliance with the standards can be observed. An agency’s Accreditation program requires the department to comply with the best practice standards in five basic areas: the Administrative Function, the Personnel Function, the Operations Function, the Investigative Function, and the Arrestee/Detainee Function. An Accredited agency must show compliance in one-hundred standards within these five sections. The municipality receives significant insurance premium discounts. Provides stiffer defense against civil lawsuits and complaints; frivolous legal actions against the agency are shown to decrease with Accreditation. Delivers an objective measure of the department’s leadership and service. Greater accountability by Written Directives that clearly define lines of authority, decision making, and resource allocation. Accreditation streamlines operations of a department, providing more consistency and more effective deployment of agency manpower. To maintain Accreditation under the NJSACOP Program, the department must be reviewed every three years for reaccreditation. This includes a full on-site assessment to ensure the agency is adhering to the required standards. Achieving Accreditation demonstrates the Avalon Police Department’s commitment to professional excellence and quality service to their communities. The Avalon Police Department is proud to be part of the approximately 30% of Accredited law enforcement agencies in the state of New Jersey. You may obtain additional information at the NJSACOP Accreditation Program website.